It’s been many months now since I returned from my backpacking trip across Asia, and I’ve still got zillions of photos to post. 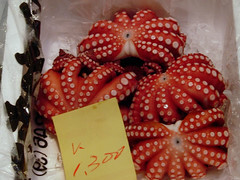 Here are 39 photos from the Tokyo Fish Market. The Fish Market in Tokyo is fantastic. I highly recommend a visit next time you’re there. Against the conventional wisdom, you don’t need to arrive at 4am. My brother and I overslept a bit, and didn’t down there til about 8am (right Pete?). Massive. Bustling. Colorful. Beautiful. Unique.